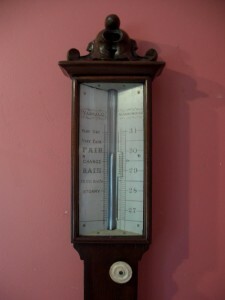 A finely made mahogany cased stick barometer made by Jerome Vassalli in Scarborough. Beautifully carved pediment above original ivory register plates. Thermometer box with ivory scale reading Fahrenheit and Reamur temperature indication. Fully restored with one years guarantee. Jerome Vassalli came originally from Switzerland moved to Merchants Row in Scarborough, Yorkshire approximately 1820. Edwardian aneroid barometer of small proportions. 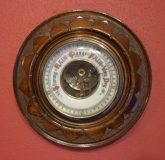 Carved walnut case with 2 piece porcelain dial under bevelled glass. Fully restored with one years guarantee. Ref: m4300.